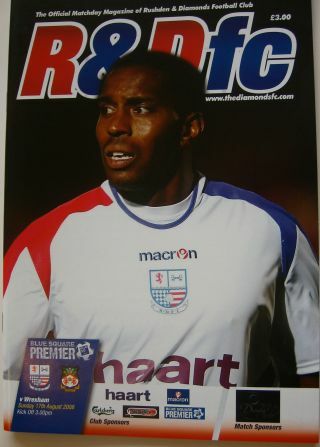 At the start of the 2008/09 season Rushden & Diamonds reached the milestone of their 900th game. Diamonds 17th season had started well with a Maunsell Cup win over Peterborough United, and two wins from their first two League games. Although Wrexham were relegated from the Football League the previous season, they had started with an impressive 5-0 victory over Stevenage Borough, although they had lost to York City the previous Wednesday. Interestingly, Stevenage and Oxford United were propping up the table after losing both of their opening games. Two names in the Wrexham line-up that would be familiar to Nene Park were Simon Brown, who was to join Diamonds on a one month loan in November, and Jefferson Louis. Despite two wins, manager Garry Hill left impressive striker Dean McDonald out of the side, with Rob Wolleaston coming into the side for his first start for Diamonds. Lee Phillips had a first half goal disallowed for offside, but it was the visitors who looked more dangerous during the first half and Alan Marriott had to be on top form to maintain a clean sheet at the break. Sam Smith replaced Wolleaston on 56 minutes and with four minutes, he had put Diamonds in front. Wrexham had failed to clear Lee Tomlin’s ball into the penalty area, the ball striking Andy Burgess. He quickly took the ball to the byline and crossed low for Smith to tap in from close range. The visitor’s equaliser was a somewhat controversial goal after play was stopped for an injury to Chris Hope. With Michael Corcoran waiting to return onto the pitch following a head injury, the referee re-started play with a dropped ball, and Diamonds down to nine men. Straight from the dropped ball, Simon Brown found Shaun Whalley who netted despite appeals for offside. Both sides had chances to win the game in the final fifteen minutes, but a draw seemed a fair result overall. Team: Alan Marriott, Curtis Osano, Gareth Jelleyman, Chris Hope, Curtis Woodhouse, Lee Phillips, Andy Burgess, Lee Tomlin, Rob Wolleaston (Sam Smith 56), Sagi Burton, Michael Corcoran (Jake Beecroft 88). Goals: Sam Smith 60 (1-0), Shaun Whalley 75 (1-1).